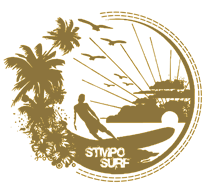 STMPO (Sand, Trees, Mountains, Pacific Ocean) is an independent clothing brand based on the West Coast, featuring apparel for active lifestyles. 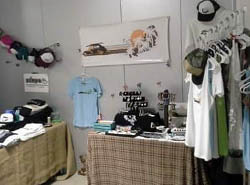 Designs include original artwork representing the coastal life, surf, and vintage cars. The STMPO brand was originally started in 1997 by 3 high school friends in Arizona who were passionate about snowboarding, skateboarding, and BMX racing. 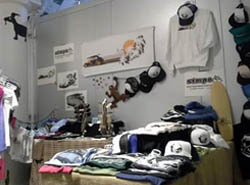 The early brand was featured in SkiPro stores, and gear sold out within a few days! A spinoff company was created by one of the 3 friends, known as STMPO Racing Products or STMPO LLC (formerly online at STMPO.com) operated in Scottsdale Arizona through 2012. This STMPO was not related to the earlier Arizona based clothing line or the later California based clothing line. From 2013 to 2018, the STMPO Clothing line operated under a DBA in San Diego California, and our apparel became increasingly popular along the West Coast, via festivals, car shows, farmers markets, craft fairs, and in outdoor lifestyles stores. The clothing was all hand-silkscreened and limited edition. Only 50-100 of each design was printed, remaining gear is still available for purchase via 111 West Retail, OB Surf & Skate in San Diego, and at select events. STMPO.org was a registered California Nonprofit 501(c)3 Public Benefit Corporation, from 2015 to 2017. The group conducted beach cleanup efforts and environmental research along the West Coast, from the Mexican border to the Canadian border. Effective November 2018, the STMPO business has expanded to Bend Oregon, with a BMX focus, operated by one of the original 3 friends who founded the company. Visit STMPObmx.com for the Oregon team!